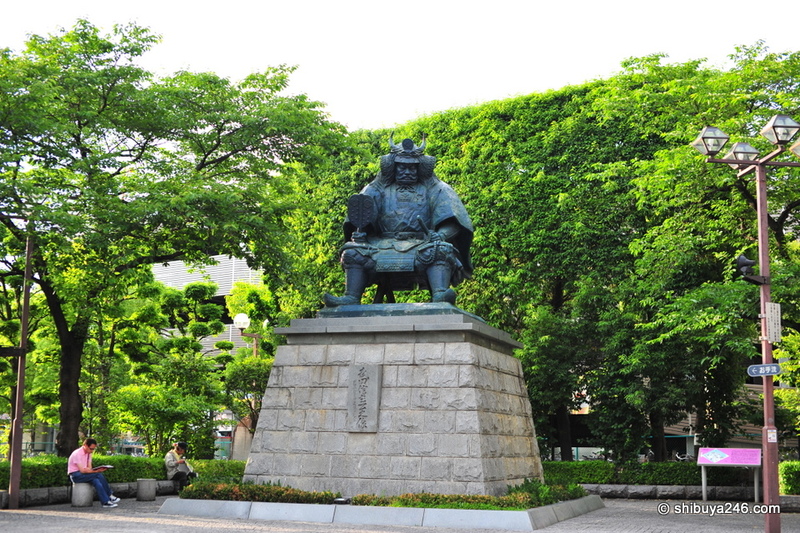 One of the statues in front of Kofu Station, Takeda Shingen. The trains in Japan always look nice and clean. Most people were already on board with bento's in hand. Going past some of the stations on the Chuo line before picking up speed as we got more into the countryside. Along the way I took some photos from the train window. When you are close in to Tokyo, you mainly get pictures of house roofs alongside the tracks. The scenery slowly changed from houses to countryside. The greenery of the countryside starts to develop as we get further out. This station was just a blur as we sped through. Can anyone read the sign? The hills start to develop a rolling landscape. Some interesting concrete bridge structures along the way. The winding road to Kofu. Getting closer to Kofu there are lots of mountains. Kofu is surrounded by mountain ranges and is like a bonchi, very similar to Kyoto, meaning in winter it is quite cold but in summer can be very humid. Not sure what was planted here, but it looked good from the train window. Maybe some sort of fruit. Yamanashi is quite well known for fruits including grapes. Getting off the train at Kofu Station. I took a quick visit with a friend to Takeda Shrine. It was only 5 minutes from Kofu Station by taxi. A quick prayer at the Shrine and then moving on to the gardens. Not sure when Hello Kitty showed up here, but I bet she wasn't around when Takeda was here. Entering the gardens at Takeda Shrine. There was quite a lot of greenery around the shrine area. It almost looked park like in its presentation. Not a lot of business being done here, but if you want a frankfurt, this looks like the place to get one. As with most country stations in Japan, there is a line up of taxis waiting to take you wherever you want. A bit difficult to get a clean shot here of Kofu Castle in between the road, light poles and cars. The angle around the back of the castle may have been a better choice. One of the buildings inside the Kofu Castle compound. Tours for the Kofu Castle story. The Castle is built in the center of town and is located on what used to be the highest point on a hill. Now other buildings tower above it, but walking to the top of this are with the green grass and welcoming breeze was really nice. View from the top of the Castle area. You can see the mountain ranges in the background. Looking down there are more historic buildings within the Castle compound. More mountains, more castle remnants. I was enjoying taking in the breeze on a humid day. The night view must be quite good from up here as well. The train line is close by. In fact you get a better view of the Castle from the train than when you are close by standing on the road. Quite a few buildings are higher than the Castle mound now, but in the old days this would have been the best place to see advancing armies from. One of the other Castle buildings with some modern gas structure tucked in behind. Always nice to see local trains outside of Tokyo. Time to jump back on the train and head for Tokyo. Next stop Shinjuku. The Super Azusa train to take me home approaches the station at Kofu. The photos are so beautiful and the green looks really vivid. I like it very much. In fact looking at your pictures makes me want to go to the country side and stay a bit in a small village with lots of nature around. One more year before Im back there and I cant wait!!! Reminds me of Kyoto a lot, especially the trip there on the Shinkansen. Can’t wait to head back again. Beautiful, would love to visit there sometime. Beautiful city.. I love yamanashi kofu. We would like to live in Busan, Sth Korea for a few years. Very beautiful!